Here I should note that the VK-3000SE is a notably versatile performer. The front panel controls allow you to name input sources, match their output levels, finely tune balance levels, invert phase, switch into mono mode, assign fixed and maximum volume settings, and adjust the cobalt blue LED display’s brightness level. From the machined-aluminum remote wand, you can switch sources and polarity, mute, adjust, and/or fade the volume. And should you so desire you can also easily fold the VK-3000SE into a home-theater system. The optional phono preamp is also nicely configurable. Two gain settings, 58dB and 44dB, should cover most of today’s mm and mc cartridges, and essentially any desired load can be configured via resistors that can be easily installed via pins on the unit’s internal PC board. 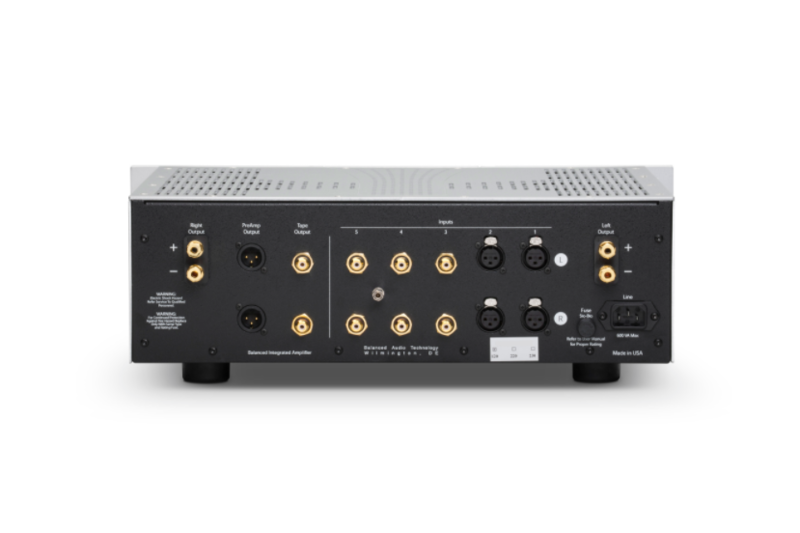 The amplifier section utilizes the same symmetrical bipolar design found in BAT’s top-of-the-line VK-6200 multichannel power amp. Rated at 150Wpc into 8 ohms and doubling to 300Wpc into 4 ohms, the VK-3000SE has enough firepower to comfortably drive the majority of speakers on the market. And it proved to be a very sweet match indeed with my reference Magnepan 1.7s, which, even in my small listening room, soak up power like the media soaks up every presidential Tweet. You can sense the VK-3000SE’s effortlessness of delivery with a wide variety of musical sources. And if you’ve yet to hear it, check out Chasing the Dragon’s most excellent direct-cut LP, España, which I recently reviewed in these pages. As one would expect from the direct-to-disc process, the recording has a great freedom of dynamic expression—as opposed to sheer power—and the VK-3000SE allows the full dynamic range and snap of Bizet’s Carmen excerpts to really strut. It also fully allows the rather fetching voice of mezzo Rosie Middleton to reach its peak without any sense of strain or aural compression. Or, for something altogether different, spin any one of the three platters from the David Bowie box set, A Reality Tour [Friday Music]. Recorded live in Dublin, November 2003, this recording finds Bowie and his stellar band in rollicking good form, ripping their way through a set of tunes that span the artist’s career to that date. The BAT’s power output encouraged me to crank the Maggies to their limit, delivering the group’s cocksure swagger and full-throttle joy. But as I suggested above, power is hardly the only or main reason for me to endorse the VK-3000SE. This amp, like all the best gear, has the ability to lift away—or more accurately, never place—layers of electronic detritus between listener and musical source, thereby conveying a sense of looking/listening in on the recorded event. The above-mentioned España is one such example, but so is something far more technically primitive such as Stephen Stills’ Just Roll the Tape [Rhino], the remarkable set of solo demos he recorded before CSN recorded its first record.